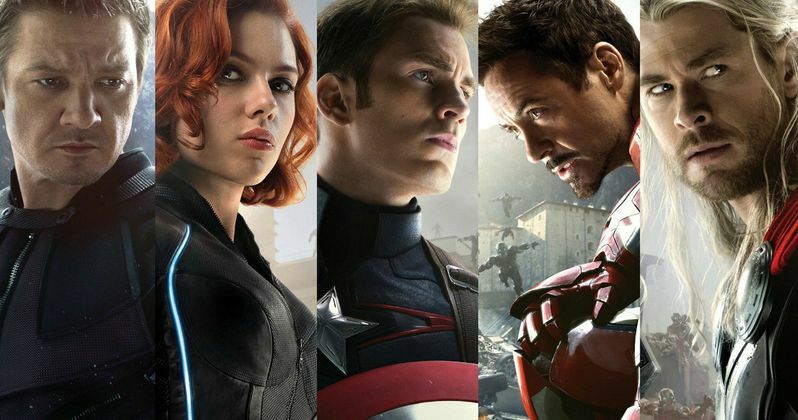 Major Avengers 2 & Captain America 3 Spoilers Revealed? With just over a month left until Avengers: Age of Ultron hits theaters, there are still a number of rumors swirling around this highly-anticipated Marvel Phase Two sequel, and how it will set up the first Phase Three movie Captain America: Civil War. There has been plenty of speculation that the movie will end with a radically different Avengers team than in the first two movies, and today a report from Superhero News reveals exactly who those team members are. There will be plenty of SPOILERS from here on out, so read on at your own risk. The new Avengers team will be lead by Captain America (Chris Evans) and Black Widow (Scarlett Johansson), with The Falcon (Anthony Mackie), Scarlet Witch (Elizabeth Olsen), The Vision (Paul Bettany) and War Machine (Don Cheadle) rounding out the team. The site also "confirms" that another rumor, which claimed that Quicksilver (Aaron Taylor-Johnson) actually dies, is true. The death supposedly happens as Quicksilver is protecting another Avenger, but a conflicting report reveals this may not be true at all. Badass Digest claims that in an earlier version of the script, Quicksilver did die, but the character lives in the most recent script. Of course, it's possible that many things may have changed between the time that the most recent script was written and now. It also seems odd to kill off a character like Quicksilver after just one appearance in the MCU, but perhaps his death brings the team closer together, like Coulson's death in Marvel's The Avengers. The site goes on to offer several details about the end of Avengers: Age of Ultron, and why some of these characters are going their separate ways. Badass Digest claims that Iron Man is "done" being an Avenger, although we will see him squaring off against Steve Rogers over the Superhero Registration Act in Captain America: Civil War. They also add that Hulk has "gone missing" and that Thor returns to his homeland of Asgard to "deal with the events leading up to Thor: Ragnarok." The site also mentions that both Hulk and Thor will not be appearing in Avengers: Infinity War Part 1, but they will both be back, along with Captain America, in Avengers: Infinity War Part 2. These vacancies in the Avengers lineup are seemingly what causes a new team to be formed, but yet another rumor claims that some of these characters may be popping up in Captain America: Civil War. We already know that Captain America: Civil War will feature Cap (Chris Evans) Iron Man (Robert Downey Jr.), Black Widow (Scarlett Johansson), Hawkeye (Jeremy Renner) and Black Panther (Chadwick Boseman), but a rumor surfaced yesterday from Bleeding Cool claims Hulk (Mark Ruffalo), Thor (Chris Hemsworth), War Machine (Don Cheadle), Scarlet Witch (Elizabeth Olsen), Wasp, and "a fourteen year old Peter Parker, Spider-Man" will also be featured. Of course, there have been rumors that Spider-Man will be a part of Captain America: Civil War, since he is a part of the comic book story, and Marvel and Sony announced earlier this year that Spidey will show up in one Marvel movie before his new Spider-Man stand alone adventure. However, with production set to begin in just a few weeks, the new Spider-Man hasn't even been cast yet, so even if he does show up in Captain America: Civil War, it doesn't seem likely that he will have a major role. Badass Digest claims that bringing both Hulk and Thor back for Captain America: Civil War "makes no sense," since Hulk's disappearance at the end of Avengers: Age of Ultron is "a pretty big deal." The site claims its possible that War Machine and Scarlet Witch could pop up, since they are both Avengers. The site also reiterates that the Winter Soldier (Sebastian Stan) has a major role in Captain America: Civil War, although he wasn't mentioned in Bleeding Cool's report. What do you think about all of these new details? Let us know what you think below.